Little, Brown Books for Young Readers, 9780316464246, 160pp. Team up with Doodletown's Hiro Itazuragaki (which means "doodle" in Japanese) as he takes over the duties of a missing superhero and has to stop an evil villain from destroying the town's supply of drawing paper! Young readers can sketch, doodle, and draw their way through the story with different options for arriving at the conclusion. And when they're finished, it's easy to go back to the beginning and create a whole new superhero saga. Chris Judge is the award-winning author/illustrator of The Lonely Beast and a number of other picture books for children. 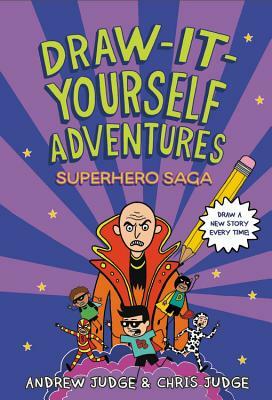 He also illustrates books for older kids, including the Danger is Everywhere series, Roddy Doyle's Brilliant, and the Create Your Own Adventures books with his brother Andrew. He lives in Dublin, Ireland with his wife Cliona and their two daughters. His favorite band is Guided By Voices, and he is allergic to carrots.